discarded. He holds rather casually a Springfield rifle musket of 1861 (another model was issued two years later). The Springfield Armoury manufactured about 800,000 of these muskets, and other sources furnished almost 900,000 more; the Confederates obtained some from their own arsenals and captured approximately 150,000 more. The men of the Stonewall Brigade were by no means soldierly in appearance. 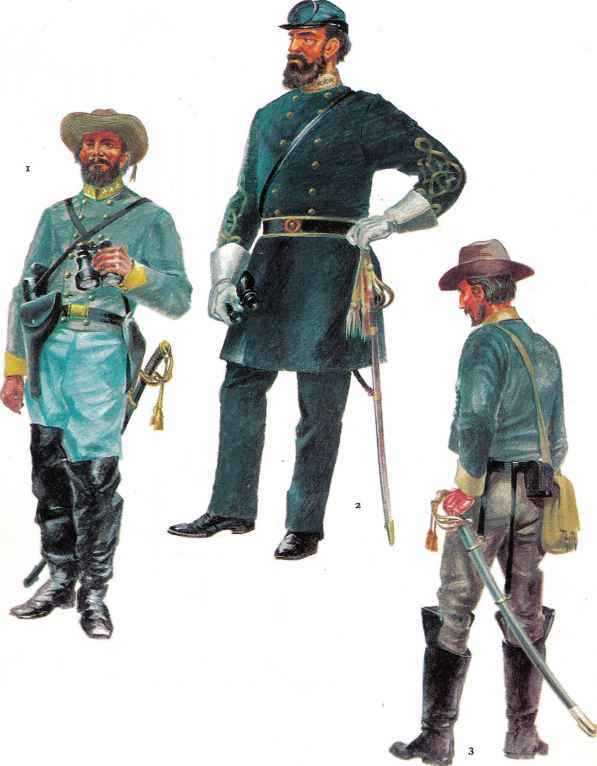 There were no definite orders about the clothing to be worn, though the cavalry and artillery who worked with them, and their own officers, made some attempt to conform with the Confederate Army Dress Regulations issued before hostilities began. At first it was forbidden to wear Federal uniform, but even this was relaxed as time went on and the Southern States ran desperately short of clothing. Clothes were all shades of grey from light blue to butternut, and soft hats soon replaced képis. Long boots also disappeared and were replaced by strong brogues which were found to be more comfortable; but a shortage of footwear in the Confederate Army was a feature of the whole war and men were generally only too pleased to wear anything that came to hand. Greatcoats and knapsacks were soon abandoned as too cumbersome for the long marches the brigade had to undertake. All that was kept was a blanket and waterproof sheet slung over one shoulder and knotted on the other side of the waist. Spare kit was carried in a small haversack. 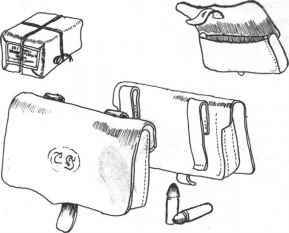 It was said that Jackson considered 'a gum cloth, a blanket, a toothbrush and forty rounds of ammunition' as the full equipment for one of his soldiers. Top right, Jennifer saddle. Centre, Confederate adaptation of 1842 model Grimsley saddle. Below, a U.S. dragoon bit on the left compared to bits imported and made by the South sack will also soon disappear, its essential contents being transferred to the rolled blanket. In his knapsack or blanket will be a waterproof sheet. This is what a typical soldier of the Stonewall Brigade looked like after two years of war. He still has his butternut tunic, but will soon discard it. The essential water-bottle and mug are well in evidence, and he has discarded his boots in favour of strong brogues. On page 19 is illustrated the shoe-boot he could well be wearing in another few months. His butternut tunic and belt-buckle bearing the 'CS' are the only remaining vestiges of official uniform. It is surprising that he has kept his tunic for so long, and the CS could well have been US by now, for the Confederates purloined a great deal of equipment from the Federals, most of which was superior to their own. Here is an artilleryman wearing the correct red kepi and light blue trousers of his arm. The jackboots show that he is a horse artilleryman. He is wielding the ramrod used for ramming home the charge, and for cleaning the barrel of the cannon. Bj Artilleryman (Cannoneer), 1862 The artillerymen who fought with the Stonewall Brigade - in contrast to the infantry - wore relatively neat uniforms. This one has a tunic with official buttons and a proper 'CS' belt. He is carrying a bucket of water to swab out the gun. This officer wears the blue képi of the infantry and a butternut frock-coat. The gaiters are the most obvious indication that it is early in the war, for these articles were soon discarded. 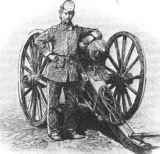 C2 Horse Artillery Officer, 1863 A correctly dressed officer of the artillery wearing the short jacket with red trimmings and holding his red artillery képi. The hilt of his sword is similar to those carried by cavalry officers, and identical with officers of the British artillery. His decorated sleeves and coloured sash give him an ornate appearance. The cavalry officers were often quite dandies, wearing feathers in their western-type hats, or attaching tassels to them, and sporting ornate braided jackets. This one also fancies himself as a two-gun man, with holsters on either hip. The Colt revolver he is flourishing lasted with minor modifications for many years and still resembles those of recent times. This officer is not so ornately turned out as the cavalry officer in Plate C3. He wears the official double-breasted jacket, and the pattern of the hilt of the cavalry sword is well shown. The dark colour of this general's frock-coat indicates that he is still wearing his old regular or militia uniform. Jackson might have dressed like this when he was a lieutenant-general and the Stonewall Brigade was serving under him in his corps. Here is a cavalry officer dressed more or less correctly except for his western hat, though by now it can hardly be regarded as improper. 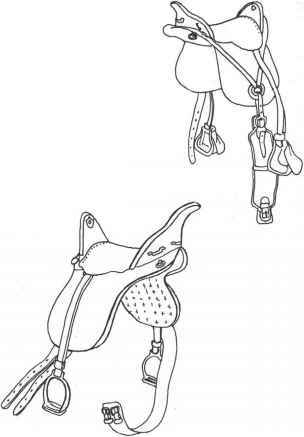 Note the cutaway pattern of the jackboots to facilitate the bending of the knee when in the saddle. This general is correctly dressed in every respect, wearing a light-coloured képi and uniform suitable for a Confederate. Gen. Joseph E. Johnston would have been dressed like this when he was Jackson's superior during the Valley Campaign. F Senior Artillery Officer, 1863 As usual with the artillery, this officer is correctly and smartly dressed with red trimmings to his light uniform, but he is wearing the western hat which senior officers on both sides favoured. 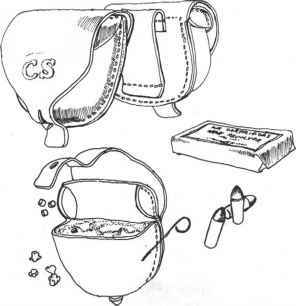 The bucket-type stirrup is well illustrated. The head-rope could be undone and used to tie up the horse. The yellow képi and yellow trimmings to the uniform are correct dress. He carries a sword tucked under the flap of the saddle and grasps a Sharps carbine probably captured from the Federals. This carbine was one of the first successful breech-loaders; it was of-52 calibre, had a rate of fire of up to ten rounds per minute, and was accurate to 600 yards. The trooper wears a western hat instead of a képi but is otherwise correctly dressed, which would have been a very acceptable standard at this stage of the war. He has bucket stirrups like the artillery officer in F. The carbine in his left hand has been drawn from its bucket unseen on the right of the saddle. He carries the regulation sabre, though they had been discarded by most Confederates by 1863.